We at Forex World Australia list up some things to consider on how much you Send money to the Philippines for your child's expenses for the new school year. Attending at a public school, if your child is still at elementary or high school, the tuition is free in general, with some minor charges on the side. Attending a Private school is different though, If you want the best education for your child in the Philippines, you may need to cough-up big sums of money. Exclusive private schools in Philippine Cities, charges between 50,000 - 200,000 Philippine peso per school year or about 1350 to 5400 Australian Dollars, do note that these tuition fees are for Elementary and High school alone, charges for Colleges and University would be higher. Prices of the tuition free for private schools may be pretty high, but students will have better access to higher quality of education, equipment, facilities and it offers better teaching curriculums, assistance and guidance to students than their public school counter-parts. Unlike Australia or the west in general, College or University students in the Philippines are still funded by their parents. Pens, rulers, pencils, crayons, set of notebooks etc. Schools have a list of required textbooks and supplies. These typically vary year after year, although some materials can be re-used throughout your child’s educational career such as rulers, protractors, and calculators, you just need to have a proper storage for your kids school supplies. If you child is already in college, buying new textbooks every calendar year may be a bit expensive as he/she may be required to have 2-3 books as reference for a single subject or course and purchasing one would cost around 2000 Philippine Pesos or 54 Australian Dollars. If you are child is already in college and you are opting to save money, you may purchase second-hand textbooks from a friend who’s already taken up the course. Growing up, not only did we have uniforms, but there were also guidelines on how to wear them, such as the required tucked-in inner shirt for boys, skirt lengths, even proper haircuts and the shoes must always be shiny. It’s largely the same for both public or private. Perhaps it is way of training students to dress appropriately and to keep themselves looking prim and proper. Private and public school uniforms typically cost around Php500-Php600 (AUD15-20) for the elementary and secondary levels. Uniforms would last about two to three years, depends on your kids growth spurts. You should also take in consideration your child transportation cost. Traveling by jeepney, tricycle, UV expresses, train, a school bus service, or via the family car. Transportation costs vary depending on your house's distance to the school, the route to and from school. Planning for your child's transportation budget as well as his comfort should be one of your priorities. Getting lodging in general happens when your child will start college, or university. If the child's school is quite far from your house or if you are from the provinces and your kid got accepted in a University in Manila, it might be best to get him a place to stay, a dormitory, apartment, or a condominium (flat) which is near the school. It provides your child with a wide array of benefits. For one, your kid can do away with transportation costs altogether, at least where getting to school is concerned. Your kid will also be able to study better if they don’t have to spend so much time traveling just to get to school. Third, living close to school means that your child will be able to rest better. 6.) Baon, Field Trip, School programs, Misc. Lastly, Baon is a Filipino word for snacks, packed lunch, or lunch money. How much "Baon," Lunch money or allowance you give to your kid is up to you. Children these days also sets aside some of their "Baon" for other things they might want to buy, like occasional outing with friends/classmates. Then again, you should also start guiding your children on how to spend money and how to save. Also you must know that every year there are some miscellaneous spending on school activities, such as Field Trips, Sports-Fest, wherein you need to pay certain fees for sports uniforms etc. They also have other activities likes Christmas programs, parties, end of the year parties, and students are required to bring food to their schools, exchange gifts, prepare for costumes during Halloween and Christmas etc. Education is one of the primary reason why Filipino Parents goes out and work abroad, to be able the earn more, send money to the Philippines and get their children to finish school. Because being a Filipino or a being parent, getting your kid graduate College or University in the Philippines is a must, having a college degree vastly improve their chances in getting a high paying job and eventually get the kids to be able to provide for themselves. 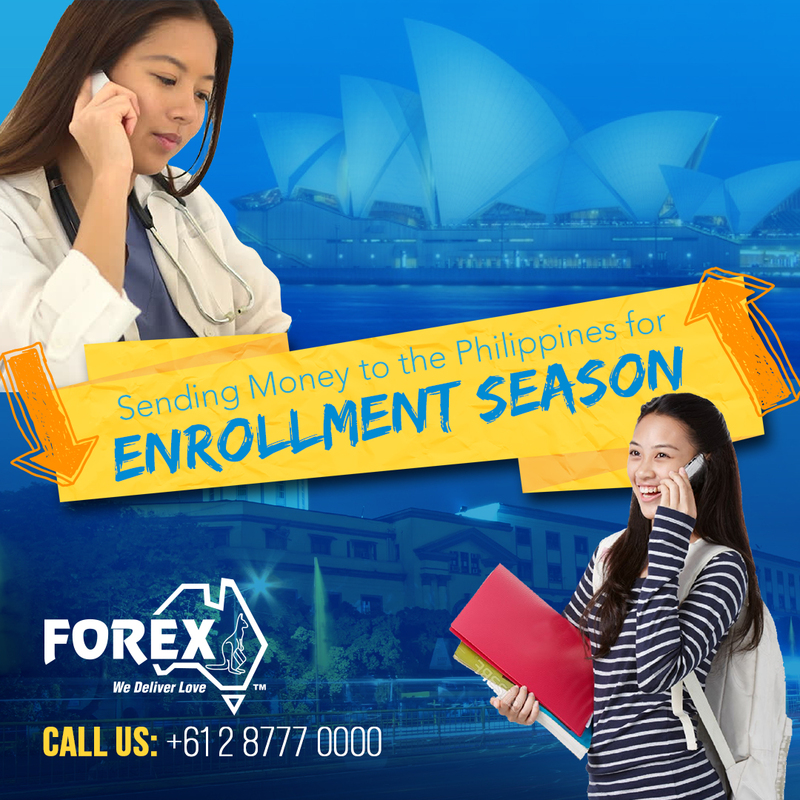 Forex World Australia is the most reliable, quickest and the most secure way to send money to the Philippines from Australia, you may send your money remittances from Australia to the Philippines through Cash Pick-Up or direct bank deposit to your loved-one’s bank accounts. We partnered with major financial and banking institutions to make a worry-free and secure money transfer to the Philippines. Send Money to the Philippines via Direct Bank Deposit to your beneficiary’s nominated bank, may it be BDO, Metrobank, Landbank, PNB or BPI to name a few. Your loved ones may also pick up the money you send from any M Lhullier, Cebuana Lhullier, SM Foreign Exchange and Palawan Pawnshops. (Please click Here, for the complete list of all the banks and financial institutions that we serve.) Please Call us at +61 2 8777 0000, or email customercare@forexworld.com.au, should you have any other concerns.